No matter what kind of job you are tackling, having a good drill bit can make any drilling job easier. As far as construction goes, the angle of the point and the material it's made of determine what you use it for. If you are drilling through hard metal, look for a titanium-coated or cobalt drill bit that has a flatter point. Split-point tips and sharper points are more accurate and work better with softer metals like aluminum. Different materials (and projects) will require different drill bits, so it's important to do your research before you buy. 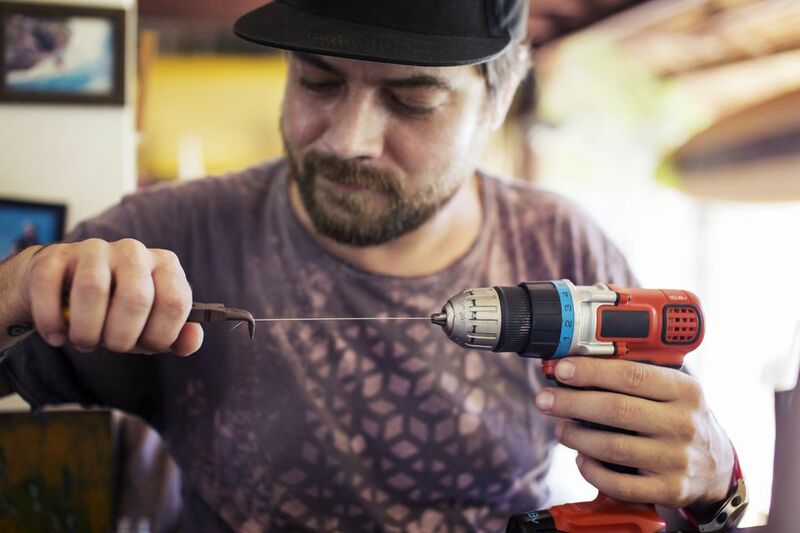 To help you find the right option for your next home renovation or DIY project, here are the top-rated drill bits on the market. This set earns the best overall spot because of the wide range of drill bits included and their versatility. Whether you're an experienced handyman or a beginner, you will be able to appreciate a kit that gives you everything you need and more. Irwin packed this kit with 29 drill bits made with heavy duty web construction and cobalt steel. This gives the bits strength and extends the life of the sharp cutting edges. The kit contains 29 bits ranging from a 1/16-inch to a ½ inch bit in 1/64-inch increments. The reduced shank allows for a larger drill bit to be used in a standard 3/8-inch chuck. Reviewers, particularly those new to using drill bits, liked the tap and drill selection chart as well as the rubber over mold case. The sturdy case kept the wide-range of bits from falling out or twisting around inside of the kit when in transit. Drill America has made a high speed shank drill bit that slips effortlessly through stainless steel to create perfect holes without leaving behind a path of grit or rough sides. The wear-resistant round shape of the shank has three sides with flat ends that create a good grip when they come in contact with the chuck. The spiral flute at the end of the bit pulls bits of the material being drilled away from the work surface so it won’t clog the job. The surface of the drill bit is treated with abrasion-resistant black oxide for a long-lasting tool accessory. Aside from stainless steel, it can also be used for iron and bronze projects. Reviewers say that for serious jobs, this tiny workhorse performs well and produces professional results. Getting through hardened steel can be difficult it you're not using the right drill bit. If you're using the wrong drill bit, the point may bounce back or dance across the surface instead of making a dent in the tough substance. DeWalt created the Titanium Pilot Point drill bit set to power through the often difficult process of drilling into hardened steel. This set of 18 titanium drill bits are made to last. They are ideal for a number of jobs in a wide-range of industries, from drilling out broken bolts, adjusting manifolds, removing exhaust systems to fixing or installing car engine parts. These drill bits are designed to prevent chipping in the hardened steel and to dissipate the heat that can build when working with this durable material. Reviewers bought these bits for their durability and lack of chipping, stalling or dulling over many uses. Using the wrong drill bit on wood can lead to disastrous results. It can reduce the aesthetic of the item or cut up the wood in a way that renders it useless for the screws or fasteners that you intend to install. Wood drill bits need to create holes that are clean and pretty as most of the work will be seen and admired. Fisch has created a brad point drill bit set that drills precise and clean holes time after time. The long-lasting bits are made of hard chrome vanadium steel. Each bit in Fisch’s 8-piece set has beveled edges for crisp, clean holes that are attractive and useful. Reviewers liked the set for its versatility. The bits can also easily pierce acrylic glass and laminates. This tidy package of drill bits can cut through concrete quickly and easily without making a dusty, clumpy mess. The carbide construction of each bit cleanly drills into concrete surfaces. The no-spin shanks reduce vibration and wear and tear on the chuck. The kit has a wide-range of bit sizes, from a pinhole 3/16 inch to a sturdy ½ inch bit for bigger jobs. Reviewers raved about the quality and design as well as the strength of the drill bit on tough concrete projects that ate up other brands of drill bits. Each bit is fluted to reduce the amount of dust that flies from the surface as the drill bit digs into the concrete material. It is a durable coating that extends the life of the bit and bores through material faster than its counterparts, which is why titanium is one of the more popular materials on the drill bit market. The Bosch Tl18 18-piece titanium twist kit has a plethora of pieces to get through wood, sheet metal, plastic, Plexiglass, vinyl siding and is strong enough to cleanly bore through cast iron surfaces. Each drill bit is coated in titanium nitride. Bosch’s speed helix design gets the right bit through the correct material faster than other drill bits, according to reviewers. The titanium bits last six times longer than high-speed steel and have a balanced double flute that significantly cuts down on vibration. This will save time, muscle fatigue and increase the lifespan of the drill battery on projects. If you don't want to spend a lot of money on a set, we recommend the Enertwist Drill Bit Set. The kit is affordable and chock full of a wide variety of bits as well as a host of fastening and driving applications. It has 246 strong and long-lasting bits to get through the hardiest of materials or gently pierce a perfect pinhole in the thinnest sheet of steel, glass, wood or plastic. Each bit is coated in high-speed steel (HSS) material titanium and is compatible with most impact drills and drivers. It has four spade drill bits, 30 black oxide HSS twist drill bits, 17 wood drill bits and 21 masonry drill bits in a wide variety of sizes among other tool accessories to create a complete, all-inclusive drill bit kit. Reviewers found the case slightly flimsy, but they did like that it provides you with a wide range of bits in an organized and lightweight case. Makita has successfully produced an affordable and professional-grade kit stuffed with bits for nearly any job requirement. The 70-piece kit has a full range of tools for fastening and driving as well as drilling. Each bit is coated in black oxide paired with a Makita-only heat treatment for a corrosion-resistant and long-lasting tool accessory. The bits are designed to work well with 3/8-inch or ½-inch driver drills or ¼-inch impact drivers. The bits are manufactured using high-speed steel with precision 135-degree split point tips. This cuts down on drill bit walking across a slick surface of glass or metal or chattering for a more precise result. The UltraLok ¼-inch hex shanks allow for quick changes of drill bits. Reviewers consistently praise the quality and durability of this set, in addition to the affordable price tag. This Makita set is one that will last and can be handed down through the generations. Our writers spent 15 hours researching the most popular drill bits on the market. Before making their final recommendations, they considered 21 different drill bits overall, screened options from 5 different brands and manufacturers, read over 40 user reviews (both positive and negative), and tested 5 of the drill bits themselves. All of this research adds up to recommendations you can trust.